Home / Home Exterior / What’s a Rain Barrel and Why Should You Get One? What’s a Rain Barrel and Why Should You Get One? Did you know that lawn and garden irrigation accounts for at least 40% of residential water use during the summer season? According to the U.S. Environmental Protection Agency, using rain barrels can help you save 1,300 gallons of water during the growing season. And you don’t need to do much to collect rain water. Just leave the barrels out to catch rainwater and that’s it. Collecting rainwater and using it for lawn and garden irrigation reduces wasted water and energy. When you have free water for your gardens, you are not dependent on the city’s water supply to care for your garden. Unlike tap water, rainwater is free from inorganic ions, mineral deposits, and fluoride compounds that pollute the soil. These compounds accumulate in the soil, affecting the root systems of your garden. Inorganic compounds from tap water also kill beneficial microorganisms that help the plants grow healthily. Using rainwater to tend to your garden is one of the easiest ways to keep your plants and the soil healthy. It creates an ideal environment conducive to root development. Installing rain barrels all over your outdoor space minimizes storm runoff flow that could cause agricultural problems. When it rains, runoff water picks up contaminants from landscapes and hard surfaces. These contaminants could be anything from toxic paint chemicals, pesticides, and oil. The rainwater could end up in nearby bodies of water, polluting rivers, lakes, and streams. Storm runoff can cause algae overgrowth and fish kills. By installing rain barrels, contaminated water can be treated or eliminated safely, reducing runoff pollution. So what do you do with rainwater apart from irrigation for the yard or garden? You can use the extra water to wash your car, flush the toilet or as bathing water for pets. You can also use rainwater to keep your compost moist! Really, with a little imagination, you can find dozens of ways to utilize collected rainwater in and around the home! Soil erosion occurs when top soil is starting to erode, causing structural damage. Keeping rainwater from reaching the soil helps reduce soil erosion. It can also contribute to the integrity of your home’s foundation. How? When rainwater falls near a structure’s foundation, the soil softens, causing the foundation to become unstable. Eventually, the soil will wear away, leaving the foundation vulnerable to water damage. 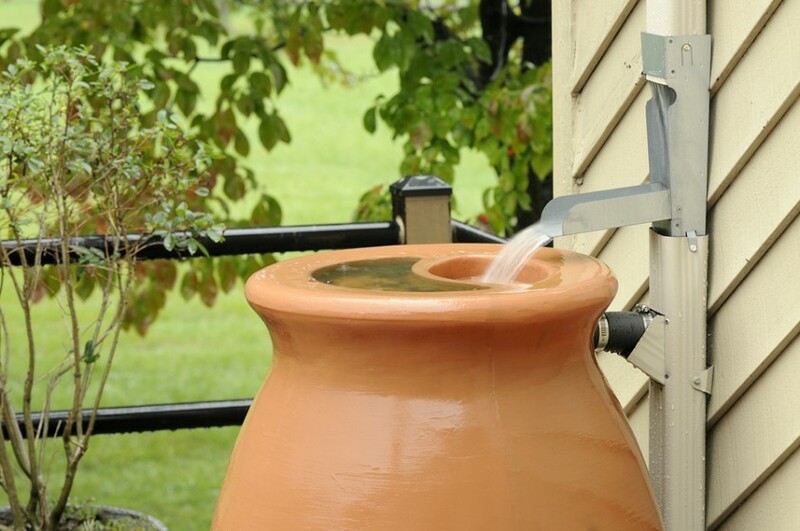 Rain barrels ensure that rainwater falls away from the foundation of your home.